Hitler's Forgotten Children is a powerful, first-person account of being at the heart of one of the Nazi’s cruellest and most obscene experiments - the Lebensborn program to create a new Aryan master race. In 1942, when she was 9 months old, Erika Matko was stolen from her family in St. Sauerbrunn in what was then Yugoslavia and transported to Germany to be ‘Germanized’ in the Lebensborn program. She was chosen because, unlike her older brother and sister, she was blond with blue eyes, and passed a medical racial examination which classed her as Aryan. Lebensborn farmed her out to politically-vetted German foster-parents. 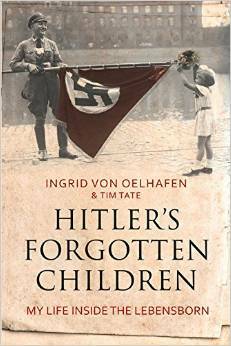 They re-named her Ingrid von Oelhafen and she grew up believing she was German. Then, one day, friends of her foster-family told her about her origins. It was the beginning of a life-long quest to discover the truth about her birth and the Lebensborn program. It was a journey which would take her across Germany, uncovering the terrible secrets of Lebensborn - including the kidnapping of up to half a million babies like her and its deliberate murder of those deemed ‘sub-standard - and back to the village where she was born. But here she would be faced with something even more painful: another woman who for more than 70 years had been living under her name – and living her life. "An emotional read and engagingly written. "